The final tapas dish and the simplest of them all. This was inspired by the same meal round a friend's as the Patatas Bravas, though I have embellished it a little and used chorizo instead of ham. 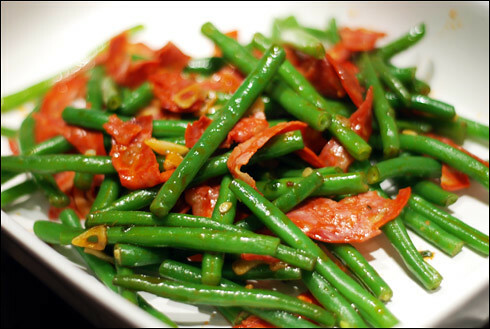 Given the rich tomato flavour of the other two dishes, this is a slightly cleaner flavour, the freshness of the green beans being the perfect complement to the smokey chorizo. Cook the green beans in boiling water for 4-5 minutes, then drain and refresh under cold water. Then slice the chorizo slices into strips and finely slice the garlic. Drizzle a hint of oil into a frying pan (the chorizo will add its own soon enough) and fry the chorizo and garlic until the garlic turns slightly golden. Then add the green beans to the pan and gently fry for a couple of minutes to allow the flavours to meld. Transfer to a serving dish and serve immediately as part as a tapas selection.